A variety of skin problems can be treated by having a skin rejuvenation treatment. A vampire facial or PRP facial can rejuvenate and resurface the skin carefully. PRP facials always deliver promising results. Here we will discuss the vampire facial benefits. Please continue reading to learn more about it. There are different options available for skin resurfacing and skin rejuvenation. Vampire facial or PRP facial is one of the most notable options to solve a variety of skin problems. The reason this technique is so acclaimed is that it works for all skin types and delivers unrivaled results, whatever your skin type. If you want to resurface or rejuvenate the skin, you should consider this wonderful treatment. Non-Surgical: One of the highlights of this technique is its non-surgical nature. This means that it can be classed as a lunchtime procedure and recovery time is minimal. No Downtime: The patient will be able to continue with his or her normal daily routine immediately after. Short Procedure: The procedure is simple and short. In most cases, it takes less than an hour fro, start to finish. For All Skin Types: All skin types and tones can have it without worrying about negative side effects. Promising Results: This procedure is a good way to resurface and rejuvenate the skin by removing the impurities embedded in the skin due to closed pores. Effective and Safe: One of the best aspects of PRP facials is that they are safe and effective. There are no major risks involved. Minimal Side Effects: Unlike many other skin rejuvenation procedures, a vampire facial has minor and temporary side effects. No Pain and Discomfort: The patient feels no pain and discomfort due to topical anesthesia applied by the aesthetician before the treatment. It is true that to obtain optimum benefits from PRP facials you have to find the right professional for the treatment, who has proven experience at performing this treatment. At Euromed Clinic Center Dubai, the professionals have years of experience at delivering vampire or PRP facials. If you are interested in knowing more, please feel free to get in touch with us now. 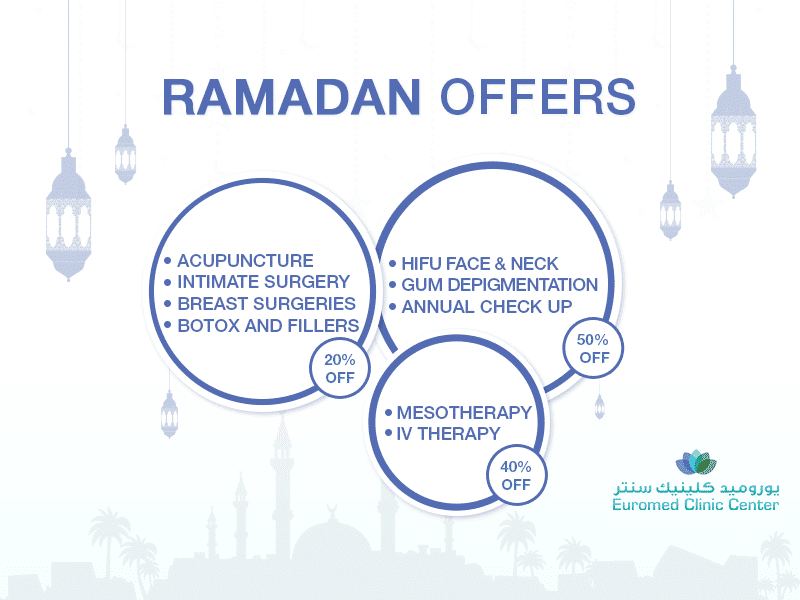 If you are interested in having a vampire facial or PRP facial in Dubai, then Euromed Clinic Center Dubai has a special offer for you. One of our experts would love to answer the questions you may have. Please do not hesitate to get in touch with us now. You can call us or fill the short online form to book an appointment with one of our experts.